Immediate access to major freeways. State of the art distribution space. Class A office building located in the Airport West submarket, 57,160 SF in 4-stories, with a typical floor size of 14,835 SF and a parking ratio of 4.00/1,000 SF. 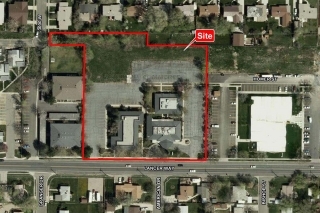 Property redevelopment opportunity with 290’ of Q Street frontage. Well located in Millard’s mixed-use area across from the newly developed Lumberyard District. The property is both for sale and for lease. - Former bank branch. - Located near downtown Granite Falls. Five-Story, Class "A" Office Building Totaling ±130,237 SF. Suites Available Immediately for Lease on Floors 2 & 5. First-Class Lobby Entrance and High-End Finishes Throughout. Prominent Access and Location on Hillside Overlooking Highway 101.